There are many different types of felt on the market today ranging from the traditional bitumen felt to Tyvek breathable. Most of the felts are now U V resistant and will not rot. The size of a roll of felt depends on the type of felt but range from 1 m x 15 m to 1.5 m x 50 m. the two types of felt we use are Tyvek breathable or protect A1 unless otherwise requested. This is a plastic tray which lays over the fascia board and is fixed to the bottom of the rafters the felt then lays over the tray and stops it from sagging between the rafters and the bottom of the tray fit’s into the gutter. Some properties may need to have ventilation to be let into the loft space, this can be done with an eaves vent strip. This is plastic strip that has slots along the length of it and is fixed to the fascia board. With this fixed to all eaves it allows a flow of air into the loft and will help stop a build up of moisture and condensation. All batten used is 25 mm x 25 mm tanalised and on a few properties it will require 50 mm x 50 mm due to the spacing of the rafters. There are a great number of slates available today and we have listed some below but we can get samples of nearly all slates available. Slate hooks are a relatively new slate-fixing hook. It is made of stainless steel so it will never rust. It is coated in a black coating so it blends into the roof and is nearly invisible, and if you get a broken slate it can be replaced with no lead tingles showing after. We strongly recommend the use of these. 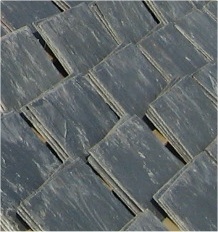 Ridges come in a large range of shape, size and colour. They can be made of a variety of different materials but are mainly clay or concrete. We can provide samples of ridges whether it is new or second hand decorative ridges. Lead is mainly used for flashings around chimneys soil pipes and also for lead valleys. We fit all our lead following the advice of British lead and building standards. We can fit lead roofs and most lead work which may be needed. We can replace most types of guttering. We recommend that you have your guttering cleaned out once a year, this will help prevent blocked drains and dampness. The fascia board is often hard to get to and after time may need to be replaced. All fascias and soffit's can be replaced with either wood or UPVC which will give your property that new cleaner look. Think of your loft space and with a little imagination it can be turned into a bathroom, bedroom or your own chill out room we can help from the design stage through to completing the work, and by using a velux window or the velux balcony system, at a fraction of the cost of moving and also adding value to your property - click on the velux link to see their full range of products.